How do these dice work? The common reads like "Capture any enemy character dice blocking Ultron Drone. 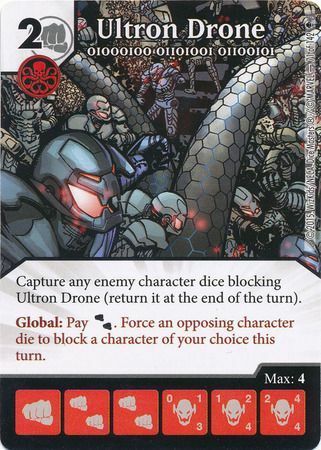 The uncommon reads like "Capture each enemy character dice blocking Ultron Drone, (and other stuff)." Can the common capture more than one enemy or is the any meant to show the drone can only capture a single enemy? It is clear the at UC can capture all blockers assigned to them, but it also gains the free damage aspect. The C confused out group. If I have two ultron drones in play can I choose which drone captures which blocker (assuming both are blocked by something). When I capture the blocker does ultron drone still hit my enemies face or does he swing at nothing since there was a declared blocker at one point? Each common die can capture one character blocking it (if it is being multi-blocked, the active player would choose). Once blocked, always blocked. Unless you give it Overcrush, it will not deal any damage to your opponent. Thanks this clears up a lot of confusion! This is another situation where we need a ruling. Capture any enemy character dice blocking Ultron Drone (return it at the end of the turn). Now, "dice" is plural - implying it can capture any or all of it's blocker. But, "it" is singular - implying it only captures one. The word "any" (Capture any...) is implied plural, also. Except.... it doesn't actually use the word dice. "Capture any enemy character blocking Ultron Drone (return it at the end of the turn)." "any enemy character" is a singular phrase, not a plural one. Definitely needs a ruling for 100% clarity. Till then I'll play it as capturing a single die. Balance between the three forms seems right to me with that choice. My question on this card, and others like it, is does the global require you to pay one die with 2 fist symbols or can you pay for it with 2 dice with fist or question marks? I know earlier sets have characters that have just 2 symbols side by side (not replicating the format on a single die), but that could be nothing more than a formatting change. Has there been a rule or official ruling I missed? Any 2 fists will do. They don't have to come from one side of one die. Thanks. That's what I thought, but I had the moderator at store draft say otherwise. Kinda made things tougher trying to use the drone. Wizkids is just trying to save space in the card text area by using 1 double-fist symbol instead of 2 single-fist symbols. Do we have confirmation of this? I thought we did, but can't find it. Would be useful to be able to link to a ruling for situations like the above where a TO reads it differently. COMMON: Global: Pay . Force an opposing character die to block a character of your choice this turn. UNCOMMON/RARE: Global: Pay . Choose an opposing character die to block a character die of your choice this turn. In the absence of a ruling, and the phrase, "Capture any enemy character dice blocking Ultron Drone", it seems reasonable to think that the inconsistent/unclear wording on the common was a proofing oversight and that the common is intended to capture every blocking dice. The uncommon costs 1 additional energy and adds this: "and deal damage to the defending player equal to its fielding cost." I would figured there should't be any difference minus one or two words missing. It all depends on their effect. Gathering the idea from the uncommon, the common should be the same minus causing damage on the fielding cost.